When John McCain picked Alaska Governor Sarah Palin, wildlife lovers cringed for two reasons. The first is that she seems like just the kind of smart, young leader who has battled corruption and government waste that could get not so environmentally friendly Republicans elected. The second is that Palin herself has been on the side of hunters instead of wildlife watchers--even when the fiscal numbers are not on hunting's side. Palin--in addition to vowing to sue to stop the listing Polar Bears as an endangered species--has put the weight of the state behind defeating a ballot measure that would have limited the aerial shooting of wolves. Nationwide aerial hunting has been banned since 1972's Airborne Hunting Act, but Alaska gets around that by saying the hunters are working for the state to control predators. The idea is to produce more moose and caribou to hunt. The Alaska Fish and Game Department has been allowing aerial wolf hunting--even though voters said no to it twice--for since 2003. (The legislature later overturned the voters' decision.) But this time Alaskans voted 92,781 to 74,124 to allow it.Why did Alaskans change their mind? It could have been, as the Anchorage Daily News suggests, because the wording was confusing: "Some who voted no on Measure 2 thought they were banning the practice, when in fact it took a yes vote to stop private hunters from gunning wolves and bears from the air." And others blame the state for spending $400,000 on an "educational campaign" on the issue, alongside nearly as much fromhunting groups. Spending state money on the campaign, drew lots of criticism, but eventually the Alaska Public Offices Commission said it was okay. But that's only the beginning of the cost of the program. John Toppenberg, director of Alaska Wildlife Aliance says the program costs about $1 million a year to run. A pro-hunting blog, Black Bear Blog, said the state spent $640,000 on predator control studies in 2006. For a while the state also tried to offer a $150 "cash incentive" to "wolf control volunteers" for each left front leg they brought in. The state insisted it wasn't a bounty, a judge said that's exactly what it was and ordered it to stop. The predator control program has been a controversy in Alaska for two decades. They've knocked off about 800 wolves since it started. That's not that many among a population of about 7,700 to 11,200. Some think that predator control programs don't really have much impact on the population in any given area because it will just make other wolves move in. The big argument for government to get involved in playing God in the wolf population is that it will increase the money spent in the state on hunting. But the hunting numbers don't add up. According to the U.S. Fish and Wildlife Service's 2006 survey of outdoor recreation, wildlife watchers outnumber those who went fishing or hunting in Alaska. For every three Alaska residents who go hunting or fishing, four go watch wildlife. And lots of them would like to see wolves. And when you include non-residents enjoying the outdoors in Alaska the ratio goes to almost three to five. Even in Alaska, only 11% of the population hunts anymore. The argument to kill wolves to support hunting is that hunters spend more money. But of $1.3 billion spent in Alaska on enjoying the outdoors, only $125 million was spent on hunting and fishing. That compares to $51 million spent on fishing and $581 million spent to watching wildlife. Tourism is a big business in Alaska and bearviewingtours are now part of that. Wildlife biologist Stephen Stringham, who wrote Bear Viewing in Alaska also runs bear viewing tours, says that the program has also killed off a bunch of bears that people used to like to watch. "While this has been underway, numbers of bears in prime viewing areas has crashed," he says, threatening lots of jobs. "Whether she really cares is questionable." Nationwide wildlife watchers outnumbered hunters (71 million to 12.5 million) and outspent them, too ($45.7 billion to $22.9 billion). 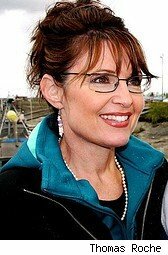 Politically, I have no doubt Palin's pro-hunting policies will help her out. But that's more of a cultural stance than one against wasting government money. Economically, they don't make sense.